Coffeeshop Johnny take their responsibility as coffeeshop owners seriously. Working along side others within the coffeeshop industry, we aim to increase the awareness of our customers through the training and education of our own staff. Every Barista who works at Coffeeshop Johnny is fully trained and certified by Cannabis Career in “Basistraining Cannabis en Goed Gastheerschap”. The training gives our Baristas specialist knowledge in the full range of products that we sell. This allows us to raise the awareness of our customers and educate them to the effects of the cannabinoids. Our Baristas is also able to give you help and advice on the different ways in which you could use our products. Every Barista is also trained to recognise problematic use and offer advice on where to find help. Marijuana is basically the dried flowering top from a cannabis plant while Hashish is made from compressed cannabis resin. Hashish and marijuana are drugs that suppress feelings and pain. Beware as they can also change the way you perceive things around. The chemical that produces these effects is called THC. Each different type of hashish or marijuana contains a different amount of THC as part of our increased customer awareness we now list this value on our coffeeshop menu. 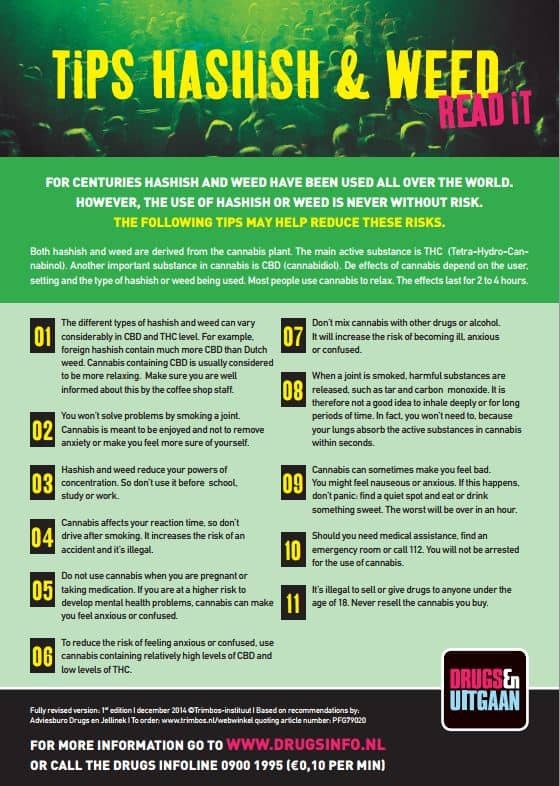 As part of Coffeeshop Johnny’s policy to increase our customers awareness we would also like to point out the risks involved with taking cannabis in any form. Customers could experience trouble with thinking logically as well as remembering simple things like what just happened. Smoking cannabis releases tar into your lungs which could cause damage. It is also possible that it could hit you in the wrong leading to loss of control, feeling sick and increased fear. Cannabis should always be used responsibly. Constant use can lead to addiction both psychologically and physically. Depending on the way you prefer to enjoy our quality products will depend when the effects will start. Customers who prefer to smoke will notice the effect after a few minutes and it could last anywhere between two and four hours. If you prefer to ingest our products in some way then be prepared for the effects not to take hold for up to an hour later. You should then expect to notice the effects for between four and eight hours. Hashish and marijuana can often give customers a cheerful and relaxed feeling. Customers can also experience music and colors to be more intense. Please note that taking cannabis intensifies your mood, so if your already feeling lousy it could make you feel even worse. Taking cannabis increases your heart rate slightly while also making your eyes slightly bloodshot. Following the test will help you discover whether you are taking too many risks. Once you’ve answered the questions you’ll receive the test results with information about your score. Depending on your score, we’ll make certain recommendations. Jellinek is the expert in Amsterdam when it comes to alcohol, drugs and addiction. Jellinek has amassed a wealth of knowledge about recreational substances and addiction. Drugs Info – Everything about drugs, risks and health. All information contained on this page and from the help line is provided by the Trimbos Institute. Test Lab Amsterdam provides analytical solutions for a complete quality and safety control system for cannabis in coffee shops. Finding answers to cannabinoid questions and scientific results. 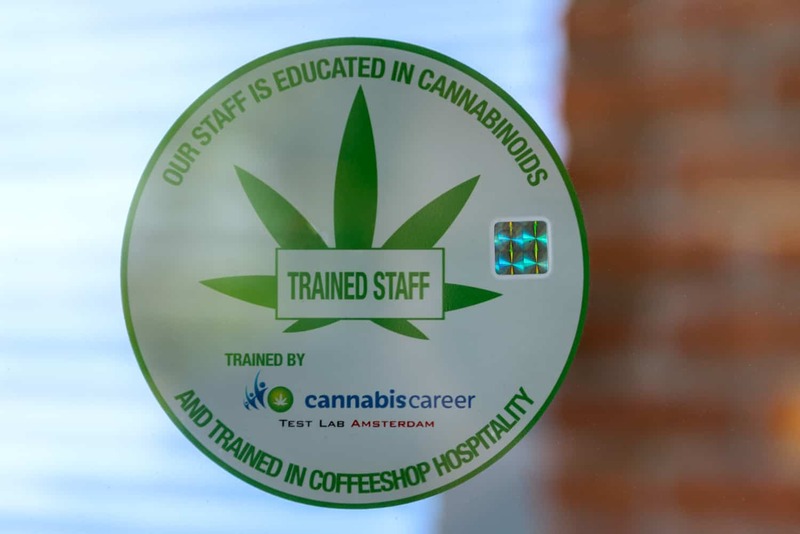 Cannabis Career is an initiative of a team of experts from the Amsterdam coffee shop industry who aim to make a valuable contribution to the regulation of the cannabis industry. Dennis de Rosa Spierings provides training, coaching and guided self-help. Raising your awareness of cannabinoids allows you to understand exactly what it is your taking and help make sure your choosing the right thing. Cannabis can be used for either medical or recreational purposes and which you buy matters greatly. The explanation below will hopefully help you understand a little better cannabinoids and which does what for you. THC and CBD are the two most prominent cannabinoids found within marijuana, but both preform different roles. THC is psychoactive and is largely responsible for the high. CBD is the cannabinoid that actually counters this, calming the effect down and enhancing the strain’s medical value. THC is best known cannabinoid present within cannabis. It stands for 9-tetrahydrocannabinol and is traditionally found in much higher quantities than its CBD counterpart. This is the most commonly recognized and abundantly found cannabinoid within cannabis; it stands for delta-9-tetrahydrocannibinol. This cannabinoid is responsible to the main psychoactive effect experienced when consuming cannabis, it stimulates parts of the brain causing the release of dopamine – creating a sense of euphoria and well being. THC also has analgesic effects, relieving the symptoms of pain and inflammation. Combined they cause a great sense of relaxation. Cannabidiol, or CBD for short, tends to be the second most abundant cannabinoid in marijuana. It has serious implications into the field of medicine, and is the sought after compound by medical users. It is a non-psychoactive component that is believed to reduce and regulate the effects of THC. This means that strains high in THC and CBD will induce much clearer head highs than more hazy, heady strains containing very little CBD. CBD itself has a long list of medicinal properties. The main of which relieve things such as chronic pain, inflammation, migraines, arthritis, spasms and epilepsy and schizophrenia. CBD has also been show to have some anti cancer properties, and new uses are being found all the time as more research is conducted. Cannabinol, or CBN for short, is an analgesic that is created from the break down of THC through oxidization. It is mildly psychoactive and is only found in small quantities within fresh cannabis plants. It can be kept to a minimum by keeping harvested cannabis stored in a dark, dry place. The effects of THC tend to be preferred to CBN – as CBN is not as strong as THC and can cause grogginess when found in high concentrates. It is also known to reduce anxiety and relieve pressure behind the eyes. CBG, also known as cannabigerol, is an active compound in cannabis that is mostly known for its anti-bacterial effects. However, very recent research has found that, whilst not traditionally though to be very prevalent within most cannabis strains, it is likely to be the “template” or “stem cell” for both THC and CBD. This means that both THC and CBD start out as CBG. CBG has also been found to inhibit the uptake of GABA, this causes a feeling of relaxation that is normally associated with CBD. These findings have spurred new ongoing research into the cannabinoid, meaning it may have even larger implications. 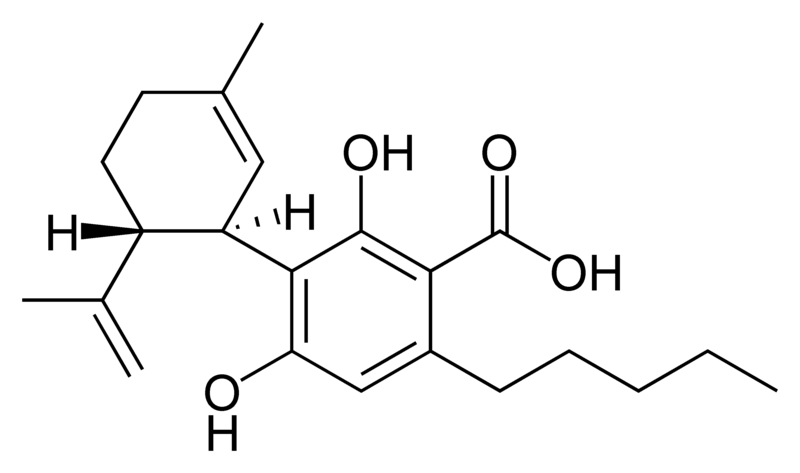 Tetrahydrocannabivarin, or THCV for short, is thought to be a cannabinoid that moderates the intensity of the psychoactive effects of THC. Current research being conducted into THCV also suggests that it can be used to treat metabolic disorders and act as an appetite suppressant. Cannabichromene, or CBC for short, is thought to have anti-inflammatory and analgesic effects, although not much medical research has been conducted into the cannabinoid. Recent research that has been done suggests that it could have a potential role to play in brain cell regrowth. THCA is the acid form of THC. It is a raw state in which THC can be found in fresh cannabis plants. It is when cannabis is heated that THCA converts to THC. When it is in this raw form, THCA is not considered to be an active compound. Much like THCA, CBDA is the acid form of CBD. It is currently thought to have antimetic (anti-nausea) effects as well as helping to fight breast cancer. However, more research into its medical benefits is needed.